As the top family-friendly hotel in the region, Sofitel Krabi Phokeethra offers an exciting variety of activities for children to revel in, ranging from art and sports sessions to Caribbean-themed poolside parties.Besides interconnecting rooms with direct pool access providing convenience for the whole family, we also supply essential kids’ services such as a baby cot, high chair, children’s menu and separate pool for kids. Additionally, we offer babysitting services and a doctor on call in case of emergencies. Test your wits and puzzle-solving skills with our exhilarating treasure hunt. Participants will meet at the Kids Club and hunt for clues around the resort which will lead to the ultimate treasure box. Yoga is not only for adults; even children can enjoy the benefits too! Join the Kids’ yoga session and get ready to stretch your limbs and balance your mind, body and soul with our experienced instructor. Our little guests can enjoy the live Frozen performance every Friday from 7 p.m. onwards at the Grand Ballroom. After the show, kids can take photos with Anna, Elsa, and Olaf as a special souvenir. Put your chef’s hat on and try one of these super cute ice cream crafts with your kids! Use our specially-made local coconut ice-cream as your starting base and enjoy decorating it any style you choose. Spend some quality family time with our Kids’ cinema. Running every day except Friday from 6:45 p.m. onwards, there are both new releases and old favorites to enjoy, with tasty popcorn just for you. Children will have an unforgettable day at the Kids’ Club where they can make new friends, play fun games, learn arts and crafts, try Thai boxing, and so much more. On Monday, Kids can take part in Sofi-Color Day activities, which include Batik t-shirt painting, balloon twister, plaster character printing and a talent show, where children can show off their unique abilities. 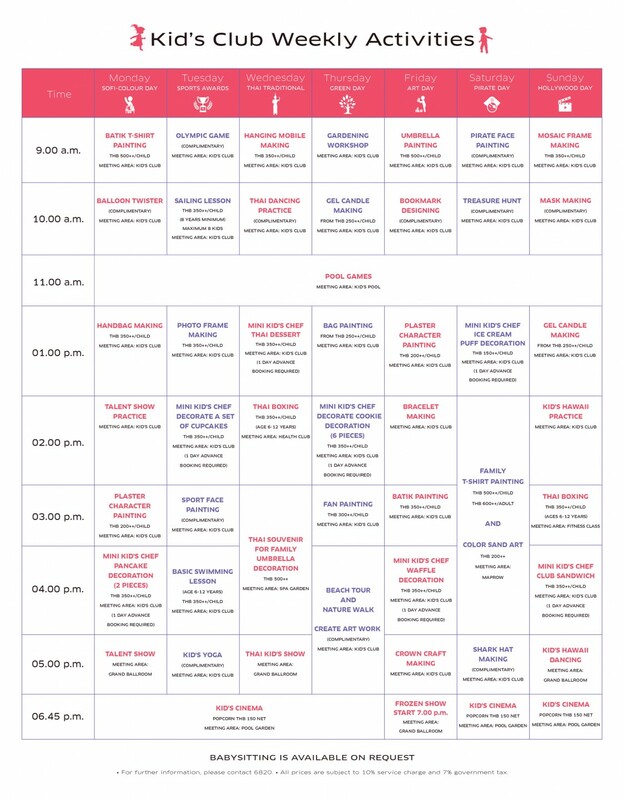 Tuesday is Sports Awards Day where you can take part in Olympic game sessions, sailing lessons and then boost up your energy by attending kid’s yoga. On Wednesday, Sofitel Krabi keeps it local, offering children the chance to take part in Thai dancing practice and Thai boxing at the Health Club during the day, and have fun with family by painting their own umbrella. Then on Thursday, during the day, kids can take part in the Green Day activities which feature a gardening workshop, gel candle-making session, beach tour and nature walk; after that they can let their creativity shine by making their own ornament card, with items collected from nature. Friday is also Art Day, and kids can channel their inner artists and learn umbrella painting, bracelet making and waffle decoration, before viewing an exclusive live Frozen show later at night. On Saturday, it is time to unwind and set sail with the resort’s Caribbean-themed poolside parties. The children will discover the prize at the end of the treasure hunt by the given clues. Moreover, the children are invited to beautify the ice cream puff decoration. At the end of the day, they can create their own shark hat. On Sunday, the resort hosts Hollywood Day with mask painting, mosaic frame making, and Hawaii dancing to thrill and delight the little ones. 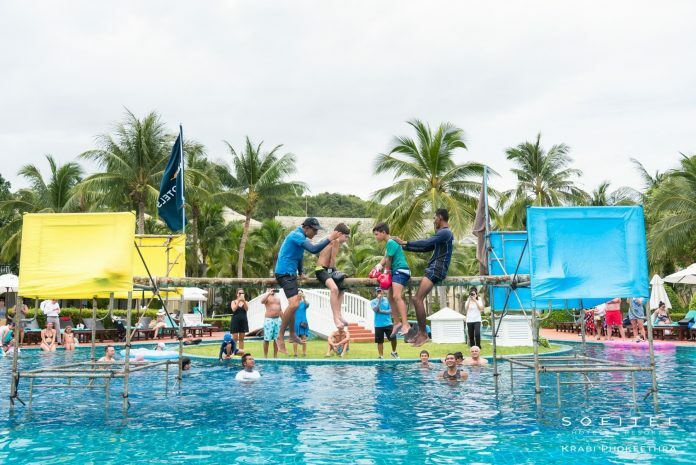 With several unique events and entertainment taking place throughout the week, Sofitel Krabi Phokeethra Golf & Spa Resort proves why it is one of the top family hotels in the area. Every night will be a night to remember with Sofitel Krabi!